In the early 1970s, Dr. John Hislop interviewed Sai Baba at length. These interviews were recorded and published in his book ‘Conversations with Bhagavan Sri Sathya Sai Baba’ (Sai Publications Trust), which became the authoritative popular source book for many about Sai Baba and his various teachings. It is packed with ‘incredible’ stories and bizarre statements by Sai Baba. According to Indian scriptural beliefs in reincarnation, ‘merging’ (with the Infinite) is a process which never leads to rebirth. Also, rebirth of former human beings as animals is either rejected as impossible or considered a punishment for horrendous deeds in life. Two so blessed as to be close friends of an avatar could not have such a fate. Hislop makes clear: "Those childhood companions, they must have been quite special. Was their further destiny unusual also? ", to which Sai Baba replies "they merged in me". These boys he claims had been reborn as dogs, and one had died under car wheels in the mid 1950s. If so, why did Sai Baba so signally fail to mention it to Hislop then? In his Dasara discourse of October 2000, Sai Baba retells the story and contradicts what he had told Hislop, so it seems the omniscient avatar of the age possibly suffered from forgetfulness! Sai Baba said in his Dasara Discourse on October 1st 2000:- “When I left Uravakonda, Kameswar Rao was the headmaster. Everyone including him cried. But I cared for none. Will I submit Myself to all this? The next day they asked another boy to lead the prayer in My place. The prayer too had been composed by Me. That boy, who was a Mohammedan, was a good singer. He walked up to the stage but could not sing, remembering Me, he broke down. The prayer was stopped and a holiday declared. Without Raju, Ramesh and Suresh refused to sit on the bench or stay in the classroom. Ramesh ran and jumped into a well giving up his life. Suresh kept crying, "Raju, have you left us! Raju, have you left us!" He became mad and was admitted to the mental hospital in Bangalore. His parents prayed to Me to go and see him once. Swami told them, "The present Suresh is different from the earlier one. There is no point in My coming to see him." After a few days, he too died. I had two dogs, Lilly and Billy in the Old Mandir. Jack and Jill were born to Lilly. The two were none other than Ramesh and Suresh come again to stay near Me. One would sleep at my head and the other at My feet. They used to get up at My slightest movement. One day the Queen of Mysore came for Swami's Darshan. She was very orthodox. She got down from her car at Karnatakanagepalli and walked up to Puttaparthi. After his dinner, the driver had to go back to the car. It was dark and he did not know the way. I ordered Jack to show him the way and the driver followed it. The driver slept in the car while Jack slept under the car. The next morning when the driver started the car, he ran over Jack's spine. From there, Jack dragged itself through the river towards the Mandir. 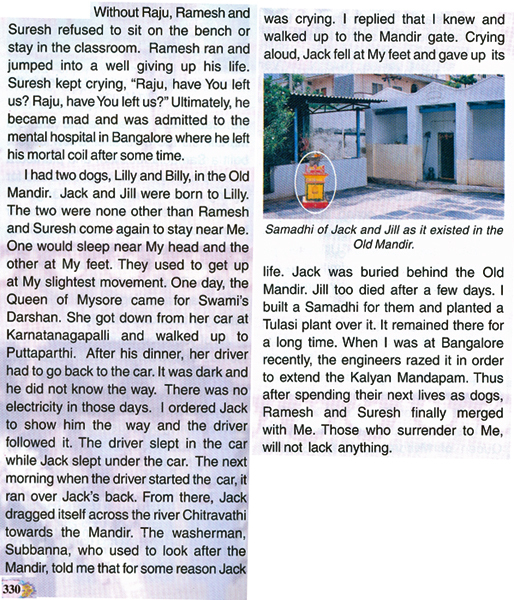 The washerman, Subbanna, who used to look after the Mandir, told me that for some reason Jack was coming whining. I replied that I knew and walked up to the Mandir gate. Crying aloud, Jack fell at My feet and gave up its life. Jack was buried behind the Mandir. Jill too passed away after a few days. I built a Samadhi for them and planted a Tulasi plant over it. It remained for a long time. When I was at Bangalore recently, in order to extend the Kalyana Mandapam, the engineers razed it. Thus after spending their next lives as dogs, they finally merged in Me. Those who believe in Me shall have no dearth of anything." 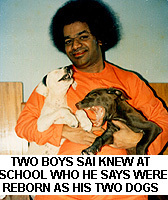 Before they died, Sai Baba cheated on behalf of these two desk companions at a school examination. They were separated at the exam hall where they had to travel to. Swami told them not to worry about doing the answers. He wrote three answers - in each their handwriting and delivered all three himself. They were the only three who passed. The answers were very similar – but as they sat apart from one another no charge of cheating could be made!